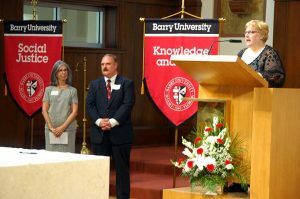 Four new Adrian Dominican Associates were recently accepted into Associate Life during two separate Rites of Acceptance at Barry University in Miami Shores, Florida. 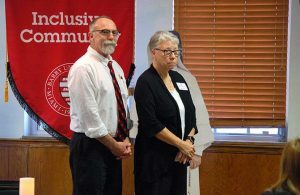 All four serve on the faculty or in the administration of Barry, which is sponsored by the Dominican Sisters of Adrian. The new Associates are Carmen McCrink, Michael Provitera, Christopher (Kit) Starratt, and Gerene (Gerry) Starratt. Carmen, an associate professor and chair of the Department of Higher Education Administration, teaches doctoral students in leadership and education and higher education administration. She enjoys teaching the History of Education course, which includes the contributions of St. Thomas Aquinas to the founding of medieval universities. Born in Cuba, Carmen moved to the United States with her family in 1962. Her hope is to continue to share the Dominican charism with her students and co-workers. As professor of organizational behavior, Michael instructs students on helping veterans and the poor and founded the Coalition of Children’s Book Authors, which has sent brand new books to the people of Tanzania. He wrote the book Mastering Self-Motivation: Preparing Yourself for Personal Excellence. Michael brings an enthusiasm to all that he does, and is ready to share the Dominican charism with his students, co-workers, and family, including his wife, Erin, and daughters Janet and Lauren. Christopher (Kit) Starratt and Gerene (Gerry) Starratt – married for 42 years – were welcomed as new Associates during a ritual on November 16. They have three adult children and are active in their parish, St. Jerome, in Fort Lauderdale. Gerry, an associate professor of education, teaches methodology and statistics for the School of Education and serves as a dissertation advisor. “Our family values – and my personal values – are aligned with the mission and vision of the Adrian Dominican Sisters,” she said in explaining her attraction to Associate Life. She is a member of her parish’s Chancel Choir and Women’s Emmaus Ministry and makes and repairs rosaries. The new Associates were mentored by Sisters Mary Fran Fleischaker, OP, Mary Tindel, OP, and Evelyn Piche, OP. Dr. Roxanne Davies, Associate Vice President for Mission and Institutional Effectiveness, facilitated the formation sessions taught by the Sisters and Associates at Barry. They will work with a new group of prospective Associates, who will study the Dominican charism and discern Associate Life. Similar Associate formation groups meet in Adrian, the Detroit area, and Flint, Michigan, and in West Palm Beach and Boca Raton, Florida. Dominican Sisters and Associates of Adrian are encouraged to organize Associate formation groups in their own areas.